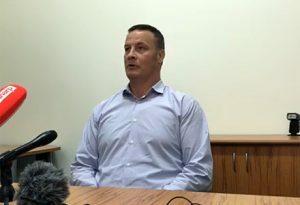 Otago University proctor Dave Scott has landed himself in hot water this week after entering a student flat without permission and stealing three bongs. Scott, who has publicly apologised today and acknowledged he made a mistake, says he was just trying to protect the students from possible police action, and was doing it out of concern for them. But at a 3pm press conference this afternoon, he failed to coherently explain to media why he also took two cans of beans, a couch cushion, a Playstation 4, a Rush Hour DVD set, a beer, 60 dollars, and had a bath before leaving. “Look, everything I did, I did with the students’ well-being in mind,” he said. “Did I cross a line at times? Absolutely, but for one, there were too many beans in that flat. You don’t need sixteen cans, I know you buy them all because they keep and you think at some point you’re going to use them, but I think most students understand that those cans just get moved from flat to flat to flat and then eventually into a family home until you finally get the courage to put them straight in the bin, and there are families that could use beans that you’re not using; my family, for example. “The cushion? Uh, look, didn’t fit the couch, wasn’t even from the same couch that it was on. Just trying to find that a home. “The Playstation 4, study distraction. Legal experts spoken to about the matter agreed that taking a bath is not a crime.